Delaware Dog Trainer with over 27 years of experience! A dog training pioneer and innovator as well as being a passionate canine trainer and behaviorist, John Van Olden has been working in some capacity with dogs since the age of 14, when he landed a part-time job with a local dog groomer. It was not an easy job, but John stuck in there and kept the same position all the way until he graduated from high school. Subsequently, John served his country as a Military Police Dog Handler and Trainer, in which he learned many of the techniques and approaches that he uses today. After his time in the military and while still attending college, John launched his first business, Golden State K-9 Training in the San Francisco Bay Area. His client list included leading veterinarians, professional athletes, and a handful of high-profile clients. In addition we are starting to work with the former clients of other dog trainers, which is exceptional and truly satisfying. After looking at different markets, John quickly realized that he had developed a training and business system that was better than the majority of what was out there. This led him to form K-9 Advantage (“Where Dogs Send Their People for Training”), the very first dog training franchise in the country. Through that endeavor, John came into direct contact with hundreds of people who were interested in getting into the dog training industry, so they could turn their zeal about dogs into a full-fledged profession. During this same time, John visited several schools for dog trainers nationwide while learning how different trainers worked with dogs and the things they achieved. PAWSitive Solutions, John’s next business, was started with Alex Hehmeyer, a veteran business professional with an extensive background in franchising and establishing career colleges. PAWSitive Solutions rapidly grew to become the biggest private dog training company on the West Coast, relying primarily on professional referrals, and employing 36 professional and highly-skilled dog trainers. As a founding member of the International Association of Canine Professionals, John has served on their Board of Directors. He has also been a consultant with some of the largest pet care and dog training companies in the U.S., and helping them to develop their dog training programs as well as leveraging their marketing efforts. John has personally trained more than 60 professional dog trainers over the years and today many of them are considered some of the best in the world. By seeing a real need for top-trained dog trainers throughout the country, John was inspired to establish the Canine Trade Group network after spending nearly three decades witnessing that the dog training industry was trending away from top standards and results-based training. 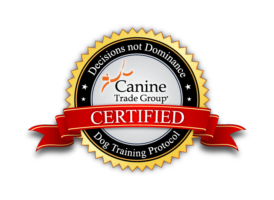 Currently, John is proud to guide the passionate trainers of Canine Trade Group, a network of professional dog trainers dedicated to things that such as full transparency, complete accountability and ethics that are unparalleled in the world of dog training anywhere today.